Microsoft rolled out the widely anticipated Windows Technical Preview yesterday morning, playing to a handpicked crowd of Microsoft reporters and analysts. Although Microsoft didn't have the technical will to broadcast the event live, you can see a recording of the 40-minute presentation on YouTube. Windows honcho Terry Myerson surprised almost everybody with the new name: "Because we're not building an incremental product, that new Windows is Windows 10." Well, it didn't surprise InfoWorld's Pete Babb, who "predicted" the Windows 9 skip in an April Fools' gag more than a year ago. But now that the name shock has worn off, exactly how nonincremental is Windows 10, and what should IT expect from Windows 10 when the bits officially arrive? With the elimination of the Windows Phone moniker and the beleaguered dual-UI nature of Windows 10's predecessor, many of the questions surrounding new CEO Satya Nadella's vision for Windows going forward have centered on cross-platform concerns, not just in terms of UI across devices but how developers would be expected to target apps at Windows in its various incarnations. To that end, Myerson set a mammoth bar for cross-platform compatibility: "We're not talking about one UI to rule them all -- we're talking about one product family, with a tailored experience for each device. And across this breadth of devices, we are delivering one application platform for our developers. Whether you're building a game or a line-of-business application, there will be one way to write a universal app that targets the entire family. There will be one store, one way for applications to be discovered, purchased, and updated across all of these devices." In a companion post, Microsoft's Jim Alkove, who leads Windows enterprise program management team, explained, "We're planning for the new, unified app store to allow for volume app purchases based on existing organizational identity, flexible distribution, and the ability for organizations to reclaim or reuse licenses. Organizations will also be able to create a customized store, curating store experiences that can include their choice of [Windows] Store apps alongside company-owned apps into a separate employee store experience." InfoWorld's Tim Anderson took a deeper look at Microsoft's Universal App strategy as it existed for developers this summer and found the cross-platform write-once development process promising, if problematic. It should be interesting to see how this strategy evolves in the months prior to Windows 10's general release. Microsoft's widening device scope for Windows has elicited questions regarding device management, as well as how separation of concerns for personal and business use will work under Windows going forward. "With Windows 10, customers will be able to use MDM to manage all of their Windows devices -- not just the phones and tablets, but PCs, phones, tablets, industrial Internet of things devices -- consistently, through one MDM interface," Myerson said. "Windows 10 has a very novel approach of separating corporate and personal data across all the devices and protecting the corporate data wherever it goes, whether it's on a BYOD device or on a managed device within the enterprise." We'll see. Microsoft offers few details as to how MDM and data protection will play out in the tough but inevitable union of mobile and PC management, though it had previously given InfoWorld a glimpse of its thinking. Alkove offered more promises -- but no details -- including "in-place upgrades from Windows 7 or 8 that are focused on making device wipe-and-reload scenarios obsolete." Along the same vein, "With Windows 10 we are able to provide an additional layer of protection using containers and data separation at the application and file level -- enabling protection that follows the data wherever it goes. Whether the data moves from a tablet or PC to a USB drive, email or the cloud -- it maintains the same level of protection," Alkove said. If you're concerned about the fast-paced update treadmill that's due to arrive with Windows 10, Alkove promises, "Businesses will be able to opt in to the fast-moving consumer pace, or lock down mission-critical environments to receive only security and critical updates to their systems. And businesses will have an in-between option for systems that aren't mission critical but need to keep pace with the latest innovations without disrupting the flow of business. And the choice isn't one or the other for businesses; we expect that most will require a mixed approach where a number of scenarios can be accommodated." Joe Belfiore, corporate vice president of Microsoft's Operating Systems Group, gave a short demo of Windows 10 Build 9841 (a trimmed version of his demo is available on YouTube). If you've been following my discussions of Build 9834 and Build 9841, some of the leaked features appear to be in the Belfiore demo. I say "some" because the demo covered a small fraction of the features we've come to expect. A word of warning: Enterprise devs will be disappointed to know that Internet Explorer 12 wasn't in the presentation and likely won't be in the Windows Technical Preview (which may or may not be Build 9841). I guess IE12 is, in Belfiore's words, a "fanciful, end-user feature." Start menu with cascading menus on the left and Metro tiles on the right. Menu items can be dragged to the tiled side, tiles can be resized, and the Start menu can be made taller or shorter by dragging, with excess tiles popping out to the right. Metro apps running in resizable windows on the desktop. The resizable Metro apps can be snapped left and right, exactly like plain, old-fashioned Desktop apps. Snap Assist, which presents you with (snappable) thumbnails of all running programs as soon as you snap one program to the left or right. You can now snap to four corners of the screen, as well as side-to-side. The new Task View icon shows thumbnails of all running apps in the middle of the screen and, at the same time, thumbnails of other desktops just above the taskbar. (See Figure 1.) Swiping from the left brings up Task View, too. The ancient Alt-Tab "coolswitch" also cycles through all the desktops. New support for the Command Prompt. (What, Ctrl-V actually pastes at the C:> prompt? Be still my beating heart.) Rafael Rivera has a good overview on his WithinRafael blog. Figure 1: Confusingly, clicking or tapping on the Task View icon on the taskbar brings up thumbnails of running programs on the current desktop (there are two in this screenshot), as well as thumbnails of all available desktops (there are four). The Charms bar is still there, but Belfiore says it will "evolve." Belfiore also showed a "design motion study" (read: video) that covers the thorny question of how to switch between touch and keyboard input -- basically, tablet and laptop modes -- on convertible devices with detachable keyboards. Microsoft's goal with Continuum, which hasn't yet been realized, is to bring up a dialog when you attach or detach a keyboard, asking your permission to switch from touch to keyboard and back again. Like IE12, Cortana -- Microsoft's intelligent personal assistant -- was conspicuously absent from the presentation, as was the sorely missed Notification Center. Storage Sense and Wi-Fi Sense, two Windows Phone (er, Windows on the phone) features destined for Windows 10 were also not mentioned. We also heard nothing about packaging, prices, upgrades, or downgrades. 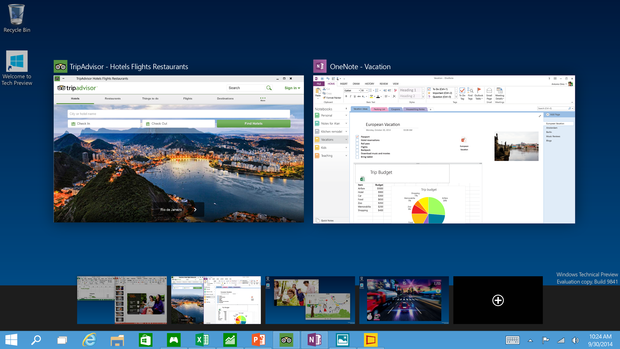 Take the InfoWorld first-look tour of Windows 10. Those interested in getting a taste of the new Windows experience, and what it could mean in corporate settings, can join the Windows Insider Program and download the Windows Technical Preview bits for laptops and desktops. In theory, that link will be live by the time you read this. Myerson says he's looking for input on the design of Windows 10 -- an enormously refreshing change from the days when Windows designers worked with study groups and telemetry. Don't get me started on steering a boat by its wake. "We plan to share more than we ever have before and, frankly, earlier than we ever have before," Myerson said. "Windows 10 will be our most open, collaborative Windows project ever." That's Myerson's promise, and I believe him. It looks like we'll see a Consumer-focused preview early next year, followed by a Universal App developer slant to the Build conference in April. "Then, later in the year , we look forward to launching Windows 10 and some amazing new devices." Maybe, just maybe, Windows is back on track.